We’ve always thought that honey from a Flow Hive stands in a class of its own, and as it turns out, the Royal Agricultural Society of NSW does too. At next year’s Royal Easter Show, the Sydney Royal National Honey Competition is launching a new competition class; Flow Hive harvested honey . Entries are open from 28 November 2018. Online entries close 12 February 2019. 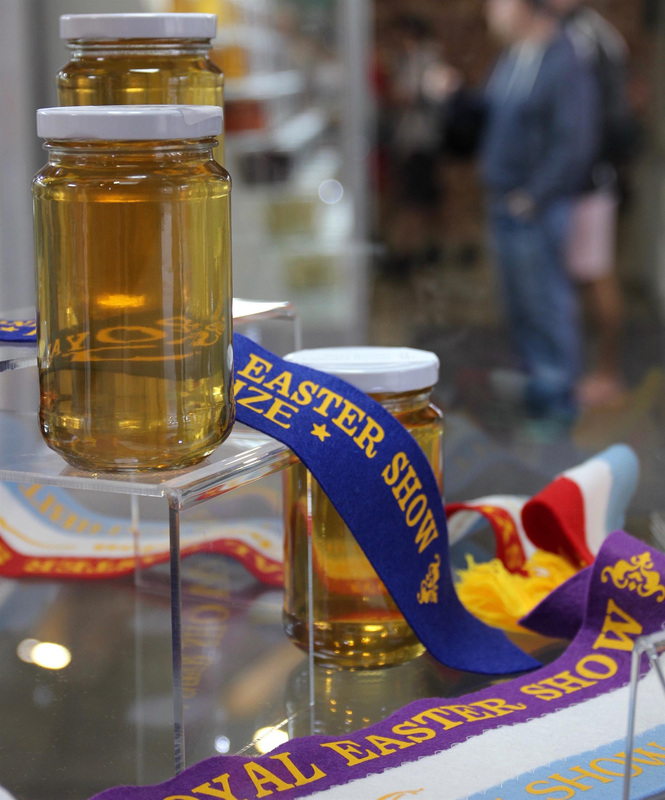 Judging takes place Tuesday 9 April, 3 days prior to the Easter Show official opening. Results will be available on the Sydney Royal website Thursday 11 April after 4pm, and on display (with ribbons) at the Royal Show 12-23 April.All the entry info is in the Schedule, including entry fee and delivery instructions. Look for Class 39: Liquid honey, any colour, from Flow Hive . Ensure your frames are 100% capped before harvesting to make sure the honey is fully ripe. Thicker honey tends to attract higher scores. Reduce the amount of air bubbles in the honey by pouring the honey down the side of the jar, and filling the jar as close as possible to the top. You may choose to filter your honey if you wish to make it clearer (this can be done by putting a stocking or similar material over the tube). Or jar your honey from a mid-flow. Follow the rules – check out the Competition Schedule for all the regulations on jar size, quantity and the various classes you can enter. To help get you motivated we have also allocate a prize for the winner – your very own Flow Beekeeping Suit or Jacket, complete with Gloves & Hive Tool, and a personalised touch; your name and 2019 competition winning title embroidered on the top pocket! Julie with her home harvest, Warrnambool, VIC. So go for it. Get your school involved, show off the excellent honey that you sell, or simply share your backyard marvellous honey with the world. The Royal Agricultural Society of NSW have been running quality agricultural competitions for years. A long standing tradition to encourage and reward excellence, and support a viable and prosperous future for our agricultural communities. P.S : The real stars of the show are the bees of course! So thank them for their valuable entry, and let them know that all honey is worth celebrating. P.P.S : Find out more about Flow Hive Honey and the unique flavour in every frame on our website here. From this page you can click through to our awesome free ‘Host Your own Honey Tasting’ pdf resource that also explains the honey colour grading system, and gives you an introduction to honey flavours. Enjoy! Is it just me or is it weird that Flow frame honey is now a separate class? Honey is honey after all regardless of the extraction method. Is crush and strained honey in a different class also? Is Flow honey allowed in other classes? The inclusion of Class 39, Flow Frame derived honey, is to encourage this growing trend in extraction. Exhibitors must sign a declaration to confirm their exhibit in Class 39 is from a flow frame only. Of course, all other classes can be entered with liquid honey extracted from a flow frame or any other method of extraction. 2019 is a record year for competition entries, and our new classes in Flow Frame and Native honey have been extremely well received by our Exhibitors! Hey Faroe, thanks for getting that info although I still find it strange having a separate class for Flow honey and that Flow honey can be entered into the regular class is curious. This could leave a bad taste in traditional entries mouths. It’s also possible that one hive could win multiple classes due to the fact that individual Flow frames can be harvested from the same hive yet each could have very different qualities. I’m not surprised they are getting record entries I’m meeting so many people who are either keeping bees or know someone who is. Credit to the Flow team. Flow has not created this new category, it is the organisation themselves that have created it. There are also commercial classes, beeswax, pollen, creamed honey and honeycomb categories amongst many other categories in the competition. It’s also possible that one hive could win multiple classes due to the fact that individual Flow frames can be harvested from the same hive yet each could have very different qualities. I don’t see this as a bad thing? Having different flower types in the one hive, and being able to enter them in different categories. Technically a traditional harvester could harvest his frames separately to get his different honey flavours and then enter these into the competition separately.